Utagawa Yoshitaki (ca 1841 - 1899) Three Actors in the Play Shiranui Monogatari, 1870. Deluxe Chuban Triptych. A fine example of a deluxe triptych by Yoshitaki. 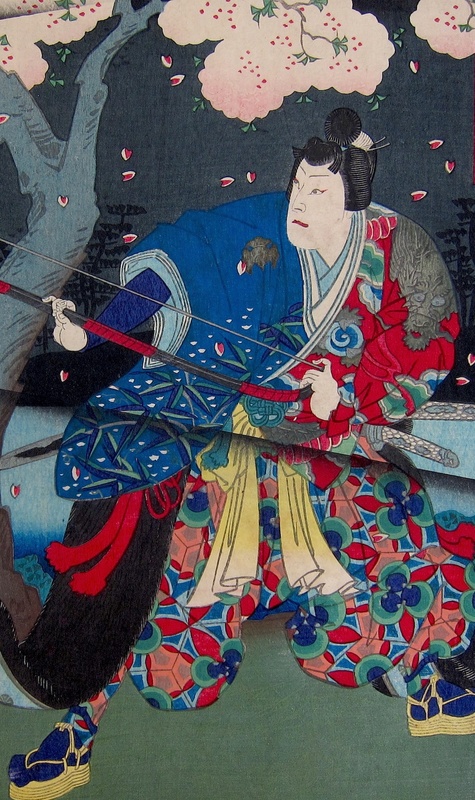 The play appears to be the story of Princess Wakana who takes revenge on a rival clan who have killed her family. The scene shows two members of the rival clan about to do battle with her. The print shows every sophistication used by the later Osaka printmakers and publishers. The ink is rich in pigment and the block cutting is intensely detailed and complex in the description of the fine patterns and folds of the costumes. Perhaps most striking is the use of the torch to illuminate the night time scene, where fine black bokashi shading delineates the line of the spotlight held by the figure on the left. The robes of the actors crackle with polished black lacquer and silver and metallic embellishment. A fine Osaka piece, complex and skillful with every print technique used to enliven the surface. Colour and impression are very fine, condition is excellent. Full size.